Chaotic, colourful and rich in culture, India attracts more than eight million tourists every year. Megan Walsh sets out to explore a small corner of this ancient land of wonder. Spanning more than three million square miles, there’s something to be discovered here for every type of traveller. From holy lakes and ceremonies to bustling bazaars and mysterious desert plains, the to-see list is long and it would take a lifetime to cover it all. So, for first-time visitors and those wanting to see some highlights on limited time, a carefully crafted visit to one area is ideal. Far away from India’s southern beaches, the northern state of Rajasthan is the perfect place to experience what India has to offer on limited time. It’s a cultural explosion and a place that will assault the senses yet leave you feeling truly enamoured and desperate to return. Most flights land in Delhi, the heartbeat of India and the main portal to the country. Loud and hectic, your first moments will be a cultural shock, but allow yourself to embrace the chaos and you’ll discover a strangely appealing charm about the country’s buzzing capital. A day or two in Delhi is plenty and it is a great starting base for your trip. 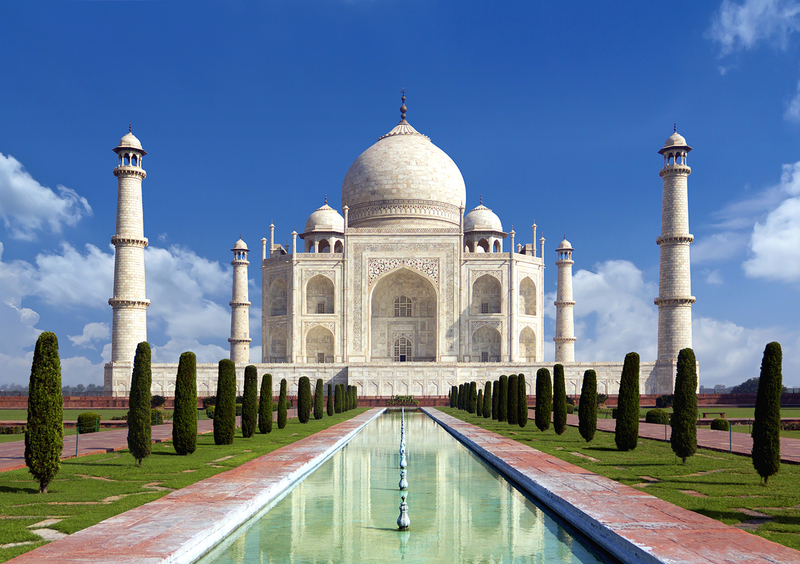 The Taj Mahal in Agra is just four hours away by train, so plan wisely to include this once-in-a-lifetime must-see. Rajasthan’s colourful capital is a place rich in history, culture and unrivalled architecture. Its pink city walls, painted in 1876 for the state visit of Prince Edward, denote the Hindu colours of welcoming and hospitality, so it’s no wonder this destination sits atop every traveller’s bucket list. As you pass through giant pink arches into the walled city you’ll be greeted by a typical cacophony of noise, smells of every sort and ear-piercing honks from vehicles of all shapes and sizes frantically honking as they scramble to veer around the docile city cows. On buildings, mischievous monkeys hang from cable wires pinching anything within reach, while nearby tradesmen flog their wares. Spend a day inside the Old City, where you’ll find some of Jaipur’s most impressive bazaars and landmarks, including the City Palace, a vast complex of courtyards and buildings dating back to 1727. You’ll have to walk a lot here, so wear comfortable shoes and be sure to carry plenty of water. After you’ve explored the palace, hop in a rickshaw to Hawa Mahal, known as the Palace of Winds and possibly Jaipur’s most famous landmark. The beautiful honeycomb facade of white marble and red and yellow sandstone with its 953 windows was designed for the Maharaja’s royal ladies – who were forbidden to walk the streets – to observe the city from above. 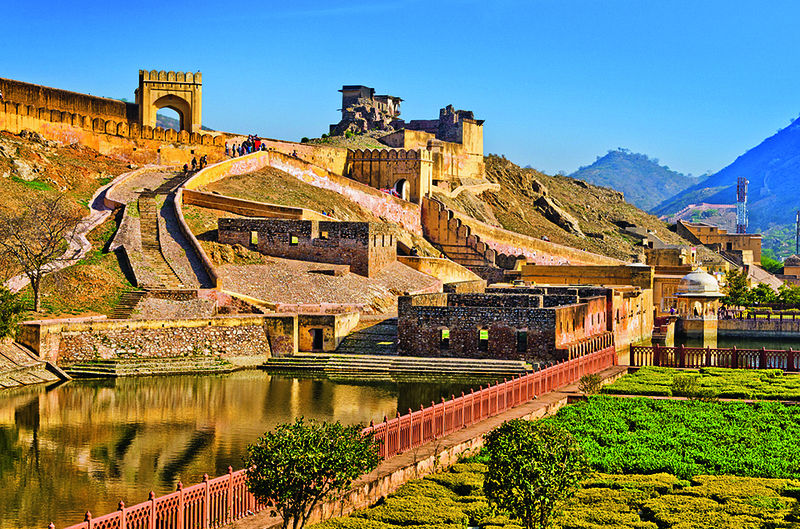 If your legs are up to the challenge, don’t leave without paying a visit to Amber Fort. Located seven miles from the Old City, it’s a breathtaking sight, that some claim rivals that of the Taj Mahal. Arrive early to avoid crowds and the worst of the heat and be prepared for the 30-minute trudge to the top or pay a small fee for a trip in a four-wheel drive. After the hustle and bustle of Delhi and the typical tourist sites, this beautiful area is balm to the soul. Commonly known as the Venice of the East, this charming place beside the shimmering Lake Pichola and surrounded by the Aravalli Hills is home to a wealth of forts, palaces, temples and bazaars. It also has some of the most mesmerising sunsets in the world. While the new part of the city is nothing to write home about, the nearby old town has countless narrow, winding streets with myriad shops and arty offerings tucked into the alleys. The locals are friendly and always happy to share a cup of chai if you have the time. For a truly magical experience, a sunset boat ride across Lake Pichola is a must. For just 250 rupees you can cruise serenely around this truly picturesque lake, surrounded by distant mountains and a stunning view of the city against a backdrop of marshmallow skies. Udaipur’s main attraction is its City Palace. The huge complex comprises 11 palaces, which were built over a span of 400 years by different rulers of the Rajput family. Blending a mix of Rajasthani, European, Chinese and Mughal architecture, it’s a super-sized and really showcases the Royal life of a maharaja. To make the most of your visit, hire the audio guide or an official guide at the entrance who will explain all the history, and make sure you don’t miss anything important. Take plenty of rupees too – on top of the nominal 30-rupee (33p) main entry fee, there are other charges ranging up to 400 rupees for various different palaces and special displays. Vegetarians, rejoice! 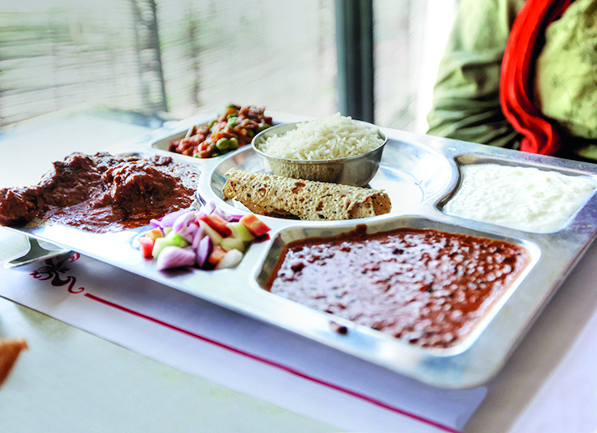 As a predominantly Hindu state, meals here are mostly meat-free. Omnivores will find chicken and mutton on the menu, though beef is not served as the cow is a sacred animal. For a traditional Rajasthani meal, try dal baati churma, a sweet and savoury lentil-based dish served with dough balls. Or try dishes from all over India such as Goan vindaloo, Kashmiri rogan josh or Punjabi spiced tandoori. And if you just can’t decide, a thali is your best option. For 200 rupees (£2.20) you’ll get a feast of several curry dishes, with rice, roti and poppadom, as well as a sweet treat to finish. Wash it all down with a refreshing shikanji (lime soda) and you’ll have a meal fit for a maharaja! There are a number of options to get around Rajasthan, such as local trains and buses, some of which are overnight, and internal flights, but we recommend hiring a driver. They start from as little as 10 rupees (11 pence!) per kilometre and for that you’ll receive a private, air-conditioned car with an English-speaking driver. There is a minimum quota of 250 kilometres a day, but that still amounts to just £14. So, for a 14-day trip, expect to pay around £350 – that’s £175 each if you’re travelling as a pair. Namasteindiatours.com, vcaretoursandtravels.com and indiabycaranddriver.com are three firms with a good reputation. While India is a beautiful place, it is not always safe, so it is wise to take some extra precautions when travelling. Ladies should avoid going out alone, especially at night. The unwanted attention you may receive is usually harmless, but there have been a rising number of sexual assault claims in Rajasthan. Adhering to local dress codes (long skirts, covered shoulders) will help to avoid unwelcome looks and comments. 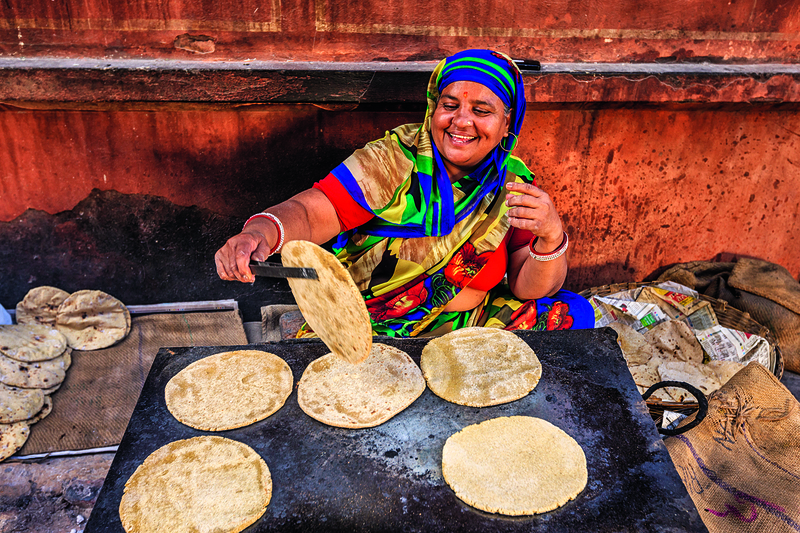 With so many delicious things to try in India, it could be easy to throw caution to the wind at the sight of fresh samosas and refreshing lime sodas. But be wary of the dreaded Delhi belly. Our foreign stomachs aren’t used to this part of the world, which puts us at risk of severe food poisoning and dehydration. Avoid anything from street-food vendors and sanitise your hands regularly, especially after handling money. Keep to bottled water and take rehydration sachets with you in case you fall ill while away. CLIMATE: October to March is the coolest, most pleasurable time to visit. Avoid monsoon season (July-September) and the height of summer (May-July). GETTING THERE: Fly direct to New Delhi with a number of airlines operating from London Heathrow, Birmingham, Manchester and Glasgow. From Delhi, you can hire a driver or catch a 55-minute connecting flight straight to Jaipur. VISA: You must have a valid tourist visa upon entry to India. An e-Tourist Visa costs approximately £57. Visit indianvisaonline.gov.in/evisa/tvoa to find out more.